Inverter/Charger from Magnum Energy is a new pure sine wave inverter designed specifically for the most demanding mobile applications. 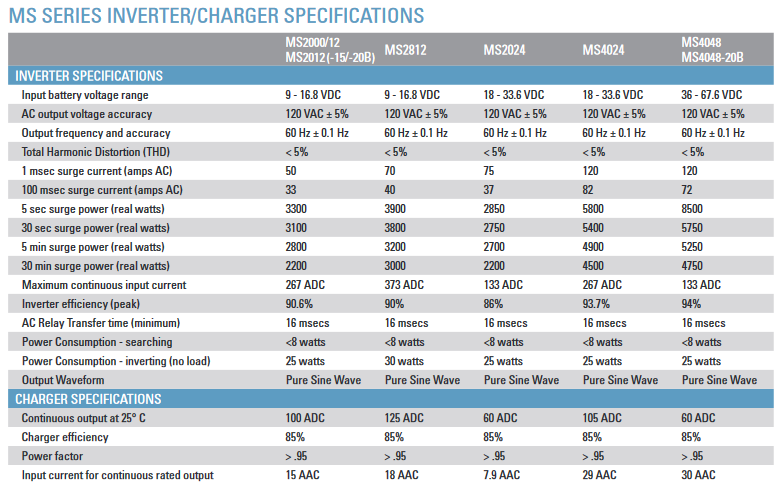 The MS Series is powerful, easy-to-use, and best of all, cost effective. These inverters are designed for RV, marine and truck applications. The MS Series is ETL listed to the stringent requirements of UL/cUL 458 for mobile use. You asked and Magnum listened. Choices: The MS Series comes in four power models and 12 and 24 volt configurations, allowing you to choose the model that is right for you. Remote control: For convenient finger-tip operation, including the new one-knob™ programming. * MS 2000 only has 1 AC input. All other models have 2 AC inputs.